Bruschetta's are ideal for entertaining. They are bite size, easy to make and super adaptable for everyone's taste. 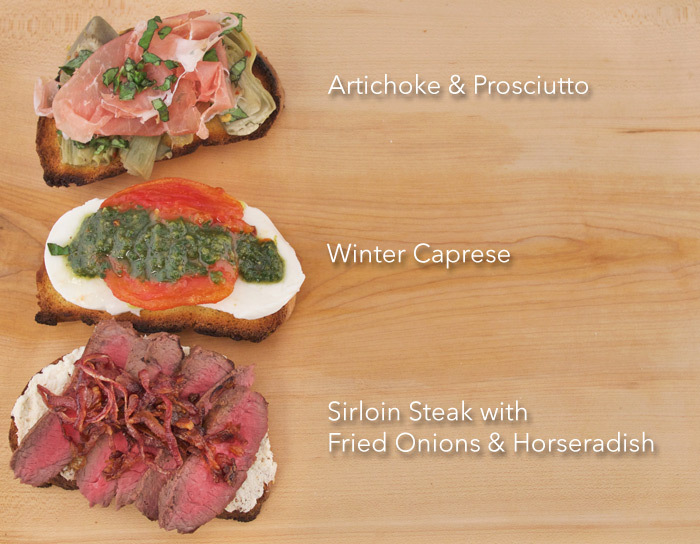 These inspiring appetizers start with the basic loaf of Italian bread cut into small rounds and lightly toasted. Each piece is then topped with a different combination of meat, cheese, and/or vegetable making the variety of bruschettas limitless. Working with ingredients I had in the fridge I came up with 3 new toppings for bruschetta which were a huge hit at a recent impromptu cocktail party. The Artichoke & Prosciutto was just that. I used fresh artichoke hearts from Melissa's Produce topped with thinly sliced prosciutto and chopped fresh basil. The Winter Caprese is a mix of homemade pesto, oven roasted tomatoes and thinly sliced fresh mozzarella cheese. The Sirloin Steak with Fried Onions & Horseradish was probably one of my favorite combinations to date. A thin layer of prepared horseradish is topped with medium rare slices of steak and caramelized onions. As you can see the possibilities are endless when it comes to this fun finger food. Be sure to experiment to find your favorite combination of toppings. I love appetizers like these. Crunchy bread bites with toppings are THE way to go for me. I especially love the steak one. Could make a meal out of it! Definitely need to give the Caprese one a try! I'm a sucker for anything on toast! Bruschetta is my go-to for parties - love these ideas! Bruschetta are my favorites. These three toppings sound delicious! I can't wait to try them out! I'd be all over that Winter Caprese! I love the variety, it makes them perfect for a party! I'm definitely the winter caprese girl, vegan version of course, but I love a good bruschetta! I love going to a party that's serving Bruschetta and all different types of Bruschetta! The Winter capreses would be my favorite! These appetizers look great! Perfect t for a party! I love bruschetta! It's such an easy appetizer or a really quick dinner.